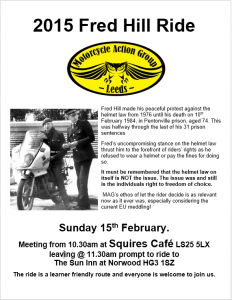 Fred Hill made his peaceful protest against the helmet law from 1976 until his death on 10th February 1984, in Pentonville prison, aged 74. This was halfway through the last of his 31 prison sentences. 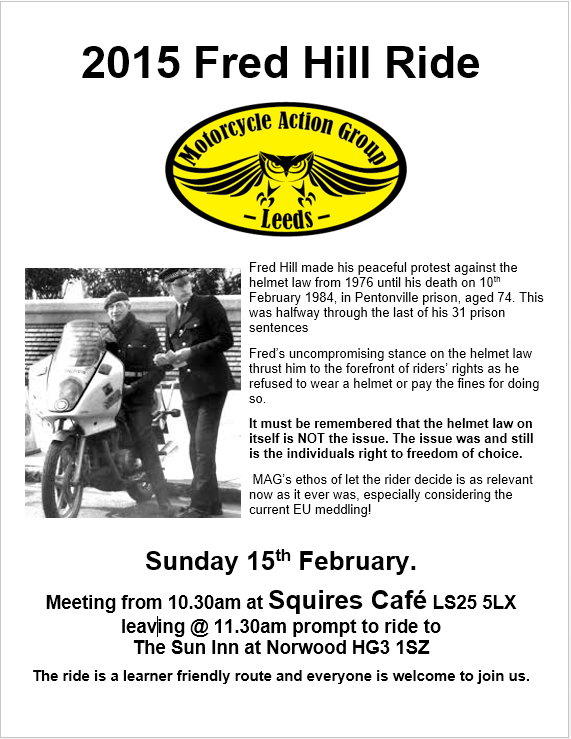 Fred’s uncompromising stance on the helmet law thrust him to the forefront of riders rights as he refused to wear a helmet or pay the fines for doing so. It must be remembered that the helmet law on itself is NOT the issue. The issue was and still is the individual’s right to freedom of choice. MAG’s ethos of let the rider decide is as relevant now as it ever was, especially considering the current EU meddling! The ride is a learner friendly route and everyone is welcome to join us.